Like many of his subordinates, Colonel Coffey was on his second deployment to Iraq. He received a Silver Star for his actions in the initial thrust of American forces into Baghdad known as Thunder Run in 2003. The colonel was a rugged man set against a desolate environment but also a cerebral student of military history, the art of counterinsurgency and the writings of Thomas Hardy. At the time, the black flag was not as iconic a symbol as it has become in the last year with the Islamic State’s successes in Iraq and Syria. However, the capture of that flag was a moment of victory that recalls previous wars in which tangible evidence of an enemy’s defeat was more prevalent. The enemy our unit faced sought to fight the superior Americans asymmetrically with improvised explosive devices, or I.E.D.s, snipers and hit-and-run tactics. Earlier in the deployment, Colonel Coffey’s unit was handpicked to clear a neighborhood of Baghdad that The Los Angeles Times called Al Qaeda’s “Alamo” during the end of the surge campaign. We lost six soldiers during that successful operation that served in many ways as a coda to the American military’s surge operations in Baghdad. In Diyala Province our unit would lose six more service members and a faithful Iraqi interpreter after insurgents rigged a house to explode when American soldiers searched it. As Colonel Coffey was a student of military history, the symbolism of capturing his enemy’s colors was gratifying to him and a fitting tribute to his fallen brethren. Although the Islamic State seeks to portray itself as an impressive military force, the insurgents we faced did not put up much of a fight when met with a well-coordinated offensive. Instead they sought to dissolve into the populace. The barbarity the Islamic State regularly displays is not unfamiliar to American service members who had the unpleasant experience of encountering its antecedent in Iraq. More important, we know from our experience that it can be defeated. The Islamic State’s military successes of the past year should be seen for what they are: fragile and reversible. Soldiers do not choose their wars. Our grandfathers’ mandate in World War II was clear and just. As we reflect on our war and the friends we lost, images like this help to vindicate our fight. While policy makers debated and then realized that there were no weapons of mass destruction in Iraq, hundreds of thousands of service members protected Iraqi civilians against violence and chaos. What was clear back then and even more so today is the inhumanity of groups like the Islamic State and their tendency to cower and flee when faced with an organized force. When deciding what to do with the captured colors, Colonel Coffey followed an unspoken code of quiet honor and dignity that American soldiers from Valley Forge to Gettysburg to Normandy would easily identify, acknowledge and respect. Instead of mounting the flag in a trophy case behind glass, he presented it to the local Iraqi security forces. This simple gesture served as a symbol of shared sacrifice and a reminder of the threat to Iraqi liberty, a threat that is now being confronted by the Iraqis themselves. 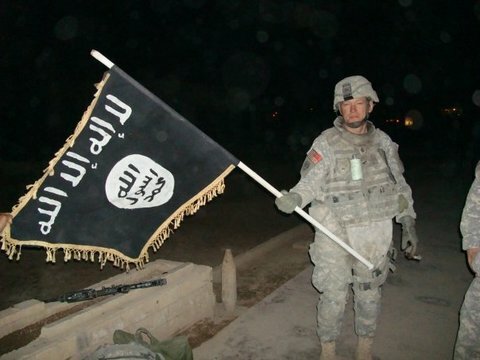 Joe Myers served two tours in Iraq as an Army fire support officer in 2005 and 2007-8. He is currently an analyst with the Department of Veterans Affairs. Tim Hsia served with Joe on both of his deployments. He works at Pocket, and is on the Service to School, or S2S, leadership team. Service to School provides free assistance to veterans applying to higher education institutions.